Risk models are an important tool for evaluating risk and responding to impending events. Reinsurance, Insurance Linked Securities and catastrophe bonds are dependent on assessing risk in susceptible locations like Florida and the U. S. Gulf of Mexico coast. Insurance Linked Security structuring agents use the models to estimate the probability of attachment for various risk transfer products. Cat bond triggers may be indemnity (based on claims or model estimated losses for a portfolio) or industry index based, or they may be parametric products based on landfall measurements of the actual hurricane (e.g. maximum wind speeds or minimum pressures in a geographic box). The models are sometimes criticized as lacking transparency and having high uncertainty but they’re not going away anytime soon. How can we reduce the uncertainty? Here are a few suggestions starting from the pre-season to following a significant event. 1) Forget about asking “What kind of season are we going to have”? Seasonal hurricane forecasts get a lot of hype and are good excuses for a June 1 press conference, but skill for seasonal hurricane activity prediction is near zero for landfall prediction especially for statistical methods. You might as well throw a dart or spin a wheel. Dynamical models are starting to show some seasonal prediction skill for overall tropical cyclone activity (e.g. the number of hurricanes) but even so, pretty much every model busted on the number of hurricanes predicted for the 2013 Atlantic season. Within the research reconnaissance aircraft era from 1956- present, its possible to reconstruct detailed storm tracks and historic wind fields using modern methods for estimating surface winds from flight-level data. Lowering the hazard uncertainty should produce model losses closer to observed claims data. With a catalog of the most important historic events affecting an area of interest, its possible for Re/insurers and ILS investors to objectively evaluate the model losses against the losses produced by the observed footprint, thereby providing an assessment of the model loss uncertainty. Significant catastrophic events need to be updated as research uncovers new insights on tropical cyclone behavior. For example, we’ve extracted flight-level data from microfilm records of research flights into 1961 Hurricane Carla and recently we updated the Hurricane Andrew footprint based on new research on estimating surface winds. Some of the new open risk modeling platforms (e.g. RiskInsight, OASIS, Elements, TouchStone, and RMS One) have (or will have) marketplace options to ingest third party, expert footprints from significant historical events. The leading forecast agencies have invested heavily in medium and extended range forecasting. The European Center for Medium-Range Weather Forecasting (ECMWF) has traditionally lead the field but following Hurricane Sandy the U. S. Government provided sorely needed resources to improve NOAA’s game. Time will tell, but it looks like the investment may be paying off after the Global Forecast System (GFS) outperformed the ECMWF for the recent New England blizzard. Both of these models conduct ensemble forecasts… for each time the initial conditions are perturbed a small amount to produce a family of 20-50 “member” forecasts issued every 6 hours. As these models improve in their ability to simulate hurricanes and take into account inherent uncertainty, they can provide valuable insight to the Re/insurance and ILS markets. Probabilisitic landfall and wind exceedance products, and the ensemble of potential footprint outcomes, may be updated as the situation develops in time. Ensemble footprint products are possible in the short range (up to 6 days), and these are expected to provide guidance to support the ILS and Cat Bond active market. For the medium and sub seasonal range of 7-21 days we’re not quite there yet. We need to figure out how to remove false alarms and how to assess reliability and skill, but this is on the horizon. As we continue to develop the ability to observe the hazard with ever improving measurement systems, parametric insurance products should become more commonplace, and the medium and long range forecasts will increasingly add to active market guidance. 4) Prepare for impending events and respond post event by uploading hazard data that takes into account all the available technology we can muster. There’s all kinds of hurricane data out there on the web, and a look at Twitter during an event can be downright scary! All kinds of “experts” are out there plotting their own spaghetti storm track diagrams and even promising to have patent-pending proprietary technology. Most of them have no track record. Having worked alongside National Hurricane Center forecasters for many years, I know their forecasts can be relied upon. With their “emergency preparedness” mission, they provide forecasts every 6 hours containing information on the position, intensity, minimum sea-level pressure, wind radii, and a static “cone” of uncertainty based on forecast errors. 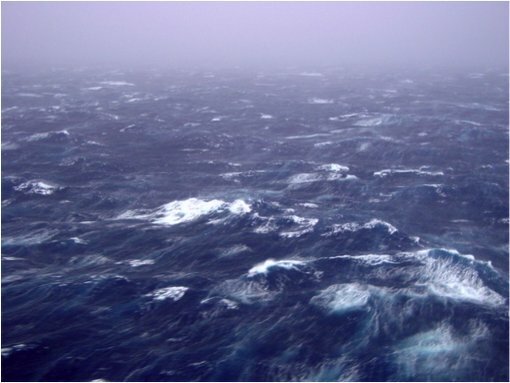 A look at the ocean sea state of Hurricane Isabel (2003) as viewed from the NOAA P3 Hurricane research aircraft at an altitude of 65 m. Photo by Michael Black, NOAA. The NHC advisories and forecasts are designed primarily for emergency management so they tend to be on the conservative side, following something former NHC Director Neil Frank referred to as the “course of least regret”. The resulting deterministic track includes a storm intensity that tends on the high side, a forecast that changes slowly, an over-warned coastline, and a damage potential (Saffir-Simpson) scale that fails miserably for large wind field – low intensity events (like Hurricanes Sandy and Ike). A more agile approach is needed to support insured loss estimates, business decision-support, and ILS market trading. Any hurricane threatening the U. S. and Caribbean typically has near round-the-clock monitoring by reconnaissance aircraft. These C130 and P3 aircraft are packed full of instrumentation including sensors that measure the emission from foam injected into the water column by breaking waves, GPS sondes that measure how the winds change with height, and Doppler radars that can sense the winds on either side of the flight track. NOAA P3 (L) and Air Force C130 (R) Hurricane Hunter aircraft. Additionally, satellite remote sensing platforms measure winds based on the energy backscattered by the tiny capillary waves that ride on top of the wind waves. New platforms on the horizon include a constellation of tiny satellites that can detect winds from the reflection of GPS signals from the sea surface. Ultimately the satellite platforms will get us to where we can analyze tropical cyclone wind fields in real-time in any ocean basin. We’re not there yet but we will be in 5-10 years. Intelligently combining the measurements from all these platforms results in a coherent wind field that can be updated in realtime. When combined with a detailed storm track the wind field can be updated as new information comes in. For example, as 2014’s Hurricane Gonzalo approached and passed over Bermuda, continuous reconnaissance aircraft monitoring, together with Bermuda’s surface observing network, allowed us to issue wind field updates every hour. Measurements from reconnaissance aircraft, buoys, conventional weather stations, and Doppler radar, when combined with a detailed storm track, result in an observation-based storm footprint. Uploading the footprint to the risk model provides insurance and Reinsurance underwriters with a loss estimate based on the latest available wind field data as an alternative to the simplistic modeled parametric wind field that comes out of the typical risk model. This reduction of uncertainty should result in more refined portfolio impact loss estimates as well as logistical support information on the locations and numbers of expected claims, and how many insurance adjusters will be needed in the impacted locations. Uncertainty isn’t limited to what comes out of the models. The observed wind fields also have errors associated with the measurement method of each sensor, the data sampling coverage, timeliness of the information, methods used to standardize observations, and the amount of smoothing in the objective analysis. Its important to include uncertainty information for the observation-based wind fields and take that into account when comparing to the model results. The future looks bright for expanding coverage of tropical cyclones to all ocean basins by adding new satellite and remote sensing platforms that can sample larger portions of the storm more frequently. These game-changers will improve our estimate of the initial condition of the atmosphere, allowing probabilistic forecast products and ensemble member data with enhanced reliability and skill at longer lead-times. All this adds up to benefits for ILS and Reinsurance investment markets through reduced hurricane hazard uncertainty in all tropical cyclone basins before, during, and after an event. Better hazard information means more accurate loss estimates and ultimately better risk assessments. Contributed by: Mark Powell, PhD is the president of HWind Scientific, LLC, a Tallahassee Florida company he founded following a long research career with NOAA’s Hurricane Research Division. Dr. Powell invented the Hurricane Wind Analysis System (HWind) and lead the development of the MET component of the Florida Public Hurricane Loss Model. He has published extensively on tropical cyclones and is an American Meteorological Society Fellow and Certified Consulting Meteorologist.